The Sadies are an amazing live band. By that logic, they are also an amazing backing band – especially if you look at their resume. To name a few, they’ve backed Neko Case, Jon Langford, John Doe and Neil Young. 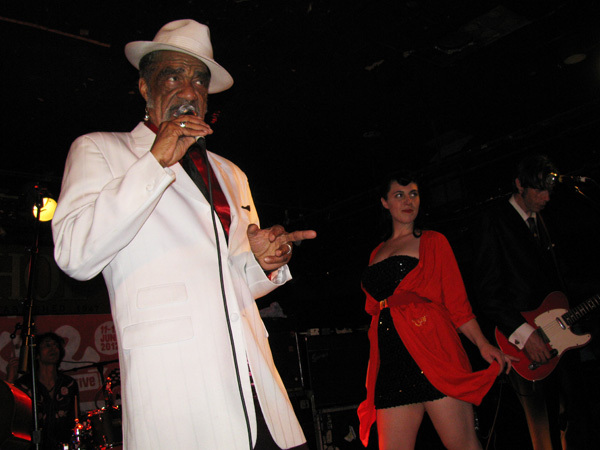 Most recently, they released the album Night & Day with R&B/blues/rock mainstay Andre Williams (with whom they also released another album back in 1999 called Red Dirt). The anticipation was high at the Horseshoe when the Sadies took their places on stage and began a slow intro. A pinup girl-style dancer, clad in a short black sequined dress and red silky robe also emerged, as audience members shouted, “Andre! Andre!” When guitarist Dallas Good announced Andre Williams’ entrance to the stage, thunderous applause and cheers erupted. Andre Williams, at 75, seemed to have boundless energy, loving every minute of the applause and adoration. Dressed in a dapper suit and fedora, he announced after several songs with a sly smile, “I’ve never seen so many pretty girls all in one place. And I’ve been to a lot of places…” The man is so smooth that halfway through the set, Williams left the stage for several minutes and returned wearing a different suit jacket and fedora. The Sadies are also the perfect backing band because they never mean to steal the spotlight, but it’s difficult not to notice their versatility and verve as they seamlessly play through another artist’s catalogue. When guitarist Travis Good switched to fiddle for one song, the audience burst into cheers of appreciation and awe. After the last song, Williams bid the crowd good night and exited the stage, as the Sadies played him out. For a brief minute, I thought for sure they would return for an encore, but alas, Reigning Sound, the last band on the bill, was slated to play at 1am. Although the NXNE-length set left the crowd wanting more, I still felt like I had just witnessed something special and rare during this whirlwind music festival.